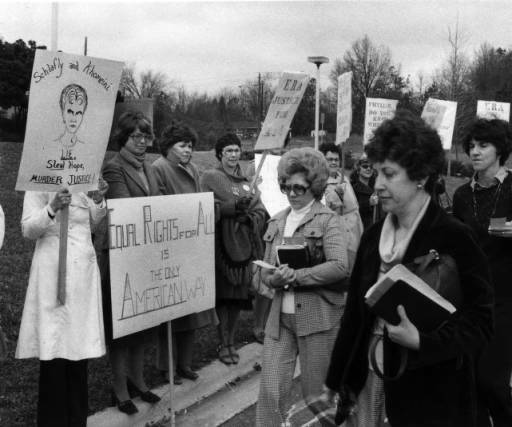 The debate over the Equal Rights Amendment proved a derisive time in American politics and the history of the women's rights movement. Many American students have never heard of the Equal Rights Amendment, let alone the fierce battle that proceeded it's failing. This unit will seek to chronicle the views of the support and the opposition using primary source documents, especially oral histories. Students will not only learn the events, but hear the voices of prominent members of both sides of the ERA Debate. This unit will be collaborative between History curriculum and English-Language Arts curriculum. - Listen to oral histories and read firsthand accounts of people on both sides of the Equal Rights Amendment debate. - Analyze how history is told differently in primary sources and secondary sources. 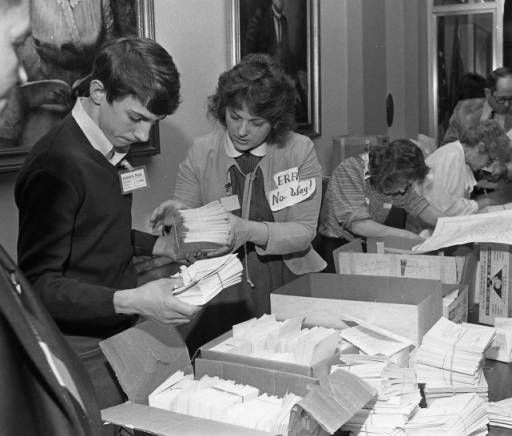 - Become familiar with the events leading up to the failing of the Equal Rights Amendment. - Listen to oral histories of the ERA debate. - Learn to write interview questions which illicit meaningful responses from the interviewee. - Create oral histories of their peers and people in the community. - Analyze how oral histories are important to historical documentation. - Students will analyze different viewpoints of the Equal Rights Amendment through a mock debate. (secondary sources) in order to compare and contrast different historical media. - Students will think critically about the historicity of events that affect a marginalized group. - Students will study oral histories about the ERA debate in order to understand the importance of oral histories. - Students will develop thought provoking interview questions and learn how to conduct oral history interviews. - Students will choose a shared event and interview a partner about it. Students will learn how to edit oral histories. - Students will interview a parent, relative, or neighbor. contribute to the historical documentation of a certain event. - CCSS.ELA-Literacy.RH.9-10.1 Cite specific textual evidence to support analysis of primary and secondary sources, attending to such features as the date and origin of the information. - CCSS.ELA-Literacy.RH.9-10.2 Determine the central ideas or information of a primary or secondary source; provide an accurate summary of how key events or ideas develop over the course of the text. - CCSS.ELA-Literacy.RH.9-10.3 Analyze in detail a series of events described in a text; determine whether earlier events caused later ones or simply preceded them. - CCSS.ELA-Literacy.RH.11-12.7 Integrate and evaluate multiple sources of information presented in diverse formats and media (e.g., visually, quantitatively, as well as in words) in order to address a question or solve a problem. - CCSS.ELA-Literacy.RH.11-12.8 Evaluate an author’s premises, claims, and evidence by corroborating or challenging them with other information. - CCSS.ELA-Literacy.RH.11-12.9 Integrate information from diverse sources, both primary and secondary, into a coherent understanding of an idea or event, noting discrepancies among sources. - CCSS.ELA-Literacy.SL.9-10.3 Evaluate a speaker’s point of view, reasoning, and use of evidence and rhetoric, identifying any fallacious reasoning or exaggerated or distorted evidence. - CCSS.ELA-Literacy.SL.11-12.2 Integrate multiple sources of information presented in diverse formats and media (e.g., visually, quantitatively, orally) in order to make informed decisions and solve problems, evaluating the credibility and accuracy of each source and noting any discrepancies among the data. - CCSS.ELA-Literacy.SL.11-12.3 Evaluate a speaker’s point of view, reasoning, and use of evidence and rhetoric, assessing the stance, premises, links among ideas, word choice, points of emphasis, and tone used. - CCSS.ELA-Literacy.RH.9-10.6 Compare the point of view of two or more authors for how they treat the same or similar topics, including which details they include and emphasize in their respective accounts. -CCSS.ELA-Literacy.SL.9-10.4 Present information, findings, and supporting evidence clearly, concisely, and logically such that listeners can follow the line of reasoning and the organization, development, substance, and style are appropriate to purpose, audience, and task. - CCSS.ELA-Literacy.SL.9-10.5 Make strategic use of digital media (e.g., textual, graphical, audio, visual, and interactive elements) in presentations to enhance understanding of findings, reasoning, and evidence and to add interest. - CCSS.ELA-Literacy.SL.9-10.6 Adapt speech to a variety of contexts and tasks, demonstrating command of formal English when indicated or appropriate.